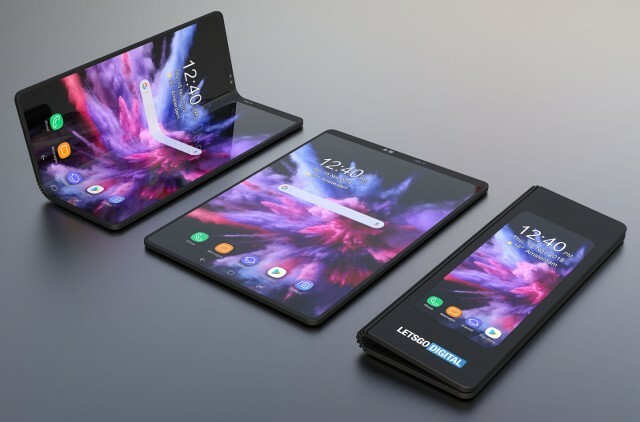 Samsung announced the Infinity Flex Display last week, but not the actual phone that will use it – the best we got was a schematic look at its design. LetsGoDitigal has put together some 3D renders based on patent drawings from Samsung rather than CAD design. In its folded form the phone, tentatively called Galaxy F, presents you with a 4.6” 480 x 1,960px display. The “hinge” looks similar to the one on the Surface Book, but this design hasn’t been confirmed (it’s one of several options patented by Samsung). The concept videofrom a couple of days ago really overestimated the size of the small screen. Hidden inside is a tablet-sized screen that unfolds to 7.3” in diagonal and 1,536 x 2,152px resolution. Samsung worked with Google to design the UI so apps can go between the small and the big screens seamlessly. Samsung will reportedly do another demo of the Galaxy F at the MWC in February before launching the phone in March. The expected price is around $1,770. That hasn’t been officially confirmed by Samsung, either, but its leadership sounds confident that it can sell one million units.